Latest from TVGuide.com's Mega Buzz, spoiler column. 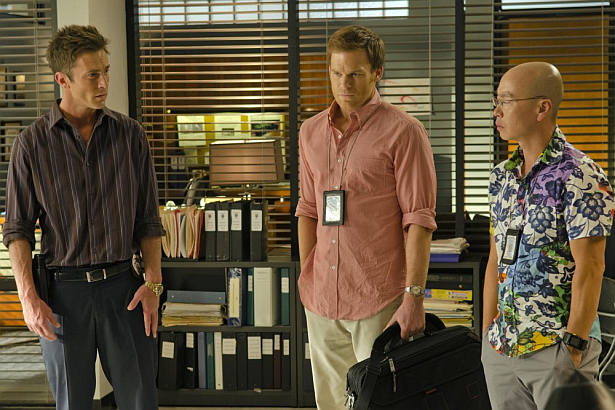 Skip the jump, to read site's latest scoop about Quinn, in the upcoming 8th season of Dexter, by Scott Buck. It probably doesn't help that the once-suspicious Quinn will be starting a fling with Dexter's nanny Jamie, since that will put him right back in the lion's den. Still, "Quinn learned to hold all his cards close to the vest," showrunner Scott Buck says. "He knows that he certainly has a lot of information that other people at the station are not aware of, so what he knows could certainly come out at an opportune moment." Let's just see if Quinn survives dating Angel's little sister. "I can't imagine Angel would be too happy about that," Buck says.